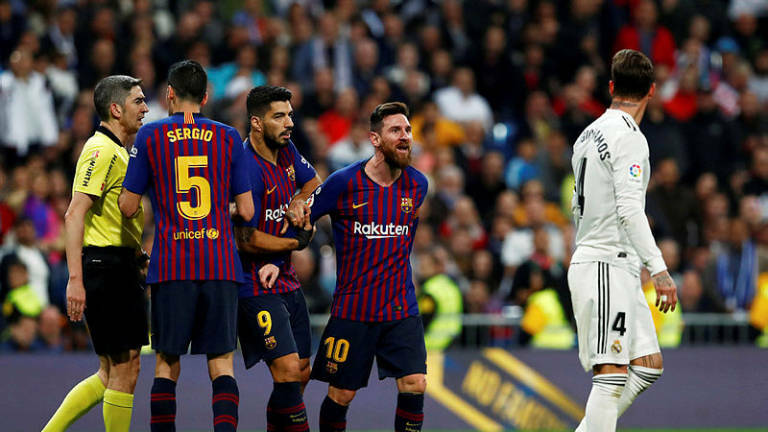 Barcelona won their second Clasico in four days on Saturday and Real Madrid might have to win the Champions League if Santiago Solari is to be in charge for the next one. Instead, Barca extended it to 12 and the way the players jumped up and down in front of the away fans after the final whistle suggested they felt this was a major hurdle overcome. When Solari took over in November, his team were seven points adrift of Barca. The fact the deficit has almost doubled since might not reflect the improvement in performances but these are surely the matches president Florentino Perez will remember when he considers his coach's future next summer. All that seemingly remains for Madrid, and perhaps Solari, is the Champions League, the competition that has so often come to their rescue before. It has also rescued Gareth Bale, who started here for only the third time in the 10 games since he returned from injury in January. But it was another frustrating night for Bale, who was largely anonymous before being whistled by the home fans when substituted in the second half. Vinicius picked up where he left off, darting in behind, only for Luka Modric to fail to finish the cutback, while Karim Benzema dragged wide after a cutting pass from Sergio Reguilon. But Madrid's early impetus faded as Barca, driven on by Messi, took control. Messi skipped through three players in midfield and was furious with Ousmane Dembele when he missed his late run into the box. Messi then weaved in behind with the help of a Luis Suarez touch but, to everyone's surprise, the trademark lifted finish floated wide. Barca were in control but the game erupted on the stroke of half-time. Ramos won the ball from Messi but, with his arm outstretched, left it long enough to catch his opponent in the face. Messi pointed to his lip and then butted heads with Ramos but referee Alberto Mallenco saw nothing worthy of punishment. Madrid pushed for an equaliser but their desperation showed in a lack of composure up front. Benzema failed to connect while Vinicius' rushed shot was blocked. Bale departed to whistles just after the hour, replaced by Marco Asensio, and Dembele should have finished it soon after. Messi sent him clear but the shot flashed wide of the far post. Isco came on in the 76th minute, a sign perhaps of desperation given he has not played more than four minutes since the end of January. Raphael Varane might have snatched a late equaliser but his header was weak. Barcelona were left to celebrate again.